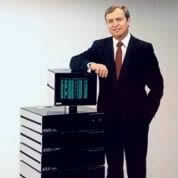 When the microprocessor chip came out in the early 1970’s, Billings jumped on the opportunity and developed his own microcomputer line –one of the first. With his new Computer System, he founded the Billings Computer Corporation. Early in his work in the computer field, Billings made a break-through design for a computer networking system which came to be known as client/server computing – the system now implemented worldwide as the predominant method for networking computers today. Now Billings is banking everything on the idea that he can sell networks of personal office computers, with 1,000 or more users on line simultaneously. Unlike other office computers, Billings’ can be connected together like Tinker Toys so that all information is on-line to all users at once – a Roger Billings invention.